Medieval Fishponds and Water Engineering Systems : M.Aston BA FSA MIFA; R.Iles BA; R.Chambers; Dr.C.Dyer BA; C.J. Bond BA FSA MIFA; S.Rippon PhD. From 2357 B.C. to 2205 B.C., the Emperors of China, Yao and Shun, appointed the World’s first recorded Fishery Inspectors and Instructors. Circa 65 B.C., the Roman General ‘Lucullus’ built the Fish Ponds of Tusculum, near the Bay of Naples. There’s a fun Circular Fish (Breeding?) pond at Lago di Paola ( See picture to Right) but so far I have no idea who built it. It took many centuries for the circular pond to catch on, now many fish farmers use them regularly. Further reading: Piscinae. Artificial Fishponds in Roman Italy. By James Higginbotham. Paperback ISBN: 978-0-8078-3604-0 Published by The University of North Carolina Press. September 2012. More on Roman Aquaculture. In a 1420 A.D. manuscript (unpublished until 1850), Dom Pichon, a French Monk of the Abbey of Reome, outlines the process of “Artificial fecundation and hatching of fish eggs”. In 1496 A.D. Dame Juliana Berners published “A Treatyse of Fysshynge with an Angle” . Reference to Carp in UK is made therein. In the early 1500’s, Prior Morton of Worcester, was producing fish on a commercial scale and experimenting with carp. (Reported in “The high Middle Ages 1200 – 1550 by T.Rowley). Prior Mors’ journal of 1530 A.D. documents well the restocking of Fish ponds. In 1547 or 1559 A.D., Ianus Dubravius de Piscinis (Bishop of Olmutz, Moravia) compiled the book ‘Study on Fish and Fish Husbandry’, (De piscinis et piscium, qui in eis aluntur natura. Pub. in Wrocław, 1547) covering in general terms, fish feeding, pond construction, plumbing, stocking for carp, tench, pike, trout and other freshwater fish. A friend of mine and keen Sustainable Aquaculture enthusiast, mentions that Dubravius based his stuff on the work of the Greek, *Xenocrates. Anyway, it was published in Latin and then in 1599 A.D. (9th February) translated into English at the special request of George Churchey. A copy of this English edition must have got into the hands of John Taverner according to my notes from Richard St. George because Taverner’s lifts a fair (or maybe unfair) amount from this Churchey edition. In 1590 A.D., Leonard Mascall published his ‘Booke of fishinge’. He was thought of by R.B.Maston, to be “The Pioneer of Fish Culture in England owing to his recipes for preserving fish spawn”. In 1600 A.D. (22nd January) John Taverner’s ‘Certaine Experiments concerning Fish and Fruite’(W.Ponsonby,London. pp38) was printed. He contributed much to the information available in Europe through observing the natural courtship, spawning of carp but there’s no indication that he tried to control the breeding in any artificial ‘farmed’ manner. 1639 A.D, ‘The Complete Book of Aquiculture’, by Hsu Kwang Chi (Ming Dynasty), was published. Was this ever re-printed? Let us know. 1683 A.D. Gervase Markham described in detail in his ‘Country Gentleman’s Handbook’, how to husband Roach, Dace, Minnows and Eels. He says (quote) that all big fish will food on “the inward garbage and blood of Sheepe, Calves and Hogges”. 1700 (circa) Bolivians develop a 500 square kilometre ‘fish farm’. In the late 1950s, Archaeologists find these earthworks in the Baures region of the Bolivian Amazon, but these are not recognised as a 300 year old system of weirs and pools for fish farming until the end of the Century when Clark Erickson of the University of Pennsylvania re-examines the site. Any updated views on this – send them on to us . 1713 (Sept.14th) The Honorable Roger North published ‘A Discourse of Fish and Fish Ponds'( E.Curll,London) concerning carp farming but a friend and fellow author on the subject, Richard St. George, tells me it’s mostly a copy of John Taverner’s work of 1600. 1758 A.D., Count von Golstein, a German Naturalist, declares that he has re-discovered man’s ability to hatch fish eggs in artificial conditions – not that ‘man’ really does much in the process. Had he been spying on Stephen Jacobi? 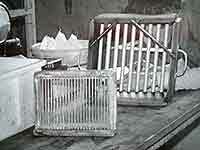 1761 A.D., Lund in Sweden invented ‘the Lund Box’ (good name to pick) … a method of keeping fish eggs once naturally spawned. By the 1790’s, Halesowen (Hales) Abbey had an elaborate fish pond system. It is still visible today. I was asked to survey this by Lord Cobham’s Estate Office a while back with a view to re-instating it for fishing use. 1837 A.D. John Shaw of Drumbugrigg, Scotland, developed skills in ‘artificially impregnating salmon eggs’, publishing his observations in 1840. Edinburgh. Is there a copy of this in your Library? Contact us. In 1842 A.D. Gehin, and Joseph Remy in France, independently re-discovered Jacobi’s methods and from this point in History, Fish Farming through artificial spawning started to become popular. 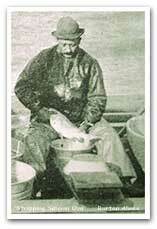 1848 A.D. Gottlieb Boccius’s book “Artificial Spawning, Breeding and Rearing of Fish” is published. 1850 A.D., Don Pichon’s manuscript of 1420 A.D. on the “Artificial Fecundation and Hatching of Fish” was published for the first time. July 1852 the salmon breeding operations at Stormontfield originated, at a meeting of ‘The Proprietors of the River Tay’. 5 th August 1852, The Huningue Institute, France, Near Basle, started work on breeding brown trout for re-stocking the rivers of France. Apparently, they built this Trout farm (following a failed attempt at another site in 1851) after the ‘Societe d’Emulation of the Doubs’ pulled all the right strings in the French Government, following a tip off from a school inspector called Mausion, who realised the importance of some fish hatching work being done by a professional Trout netsman, Remy, who along with his friend, J.-B. Gehin (who ran the local pub) was worried about dwindling trout stocks. 1853. Book by M. Coste entitled “Practical Instructions upon Pisciculture”. 1853. Edmund and Thomas Ashworth pub. “Propagation of Salmon and other Fish”. Stockport. 1850’s, Vogt in Switzerland was working on something but so far, I haven’t had a moment to research this so if you are in Switzerland or know about Vogt’s work, could you send me a sentence or two to put here. c. 1854. After reading Stephen Ludvig Jacobi’s German experiments of 1763 A.D., Dr. T. Garlick (of Cleveland, Ohio, North America) and Mr. Ackley started having great success rearing different freshwater fish in America. They probably did some work on Rainbow or Steel head trout whilst Europe was still working with their Brown trout at this time. They published in *1857. Autumn 1856. The major discovery of the ‘Dry Method’ of taking fish eggs (i.e. onto a sieve, not into or underwater) was made in Russia, by M.Vrasski. (Or some spell it Wrasky) This breakthrough method turned fish farming around but it’s not quite the same one used nowadays for today, the eggs go into a bowl with the ovarian fluid which works a treat – I can’t credit anyone with this more ‘moist method’ yet, but if you know of the person who should be included in this “Fish Farming Hall of Fame” for ditching the Vrasski sieve idea then tell me please and I’ll update this. Thank you. 1857. Theodatus Garlick*, M.D., North America, published his findings in “Fish Culture : A treatise on the Artificial Propagation of Fish”. New York. 1862. William Brown. “Natural History of the Salmon, as ascertained at Stormontfield”. Glasgow. April 2nd 1863, the opening of the First Public Aquarium ( Fish House in Regents Park Zoological Gardens, London. Keeper: James Tennant). In this same year Frank Buckland published his book on Fish Hatching, displayed fish-hatching apparatus in the window of the offices of “The Field” Magazine in the Strand, London, and started work on the World’s first ‘Museum of Economic Fish-Culture’. 1864 A.D., M. Coste and Dr. Kemmerer “Propagation of Oysters”. Brighton. Do you know whereabouts this took place? Add your facts. 1865 A.D., the book ‘Fish – Culture’ by Francis Francis was published. His Grandson, John M. Francis of Ropley donated a copy of his Grandfather’s book to the World of Water library in 1986.
c. 1866 A.D., Seth Green made the first attempts to organise a series of Fish Breeding stations throughout America. He published his work “Trout Culture” in 1870, Caledonia, New York. 1868. William Beard, M.D., “Practical Water Farming”. Edinburgh. 1868 . Thaddeus Norris. “American Fish Culture”. Philadelphia. 1870 A.D. The First Sturgeon Farm was set up, in Russia. I think there is about 26 now but if you are in Russia and know the latest score, hi there, let us know and we’ll update this. Thank you. I’ve never tasted Sturgeon or the smaller Sterlet but I love the pattern of their scales and their overall shape. 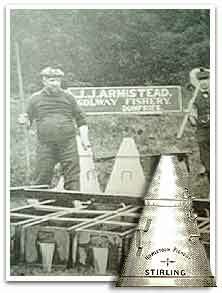 1870 The American ‘Fish Culturists’ Association’ was formed. circa 1872 In U.S.A., ‘The Bureau of Fisheries’ was formed. 1885. America’s first commercial marine hatchery was in full operation at Woods Hole, Massachusetts. Soon after, another was set up at Gloucester Harbour, North of Cape Cod. 1885 in Europe, saw a “common fisheries policy” start. Due to pollution of the River Rhine thus the decline in Salmon stocks, all those states bordering the Rhine agreed to jointly manage its long Salmon Fishery by building Salmon Hatcheries. They didn’t manage to halt the pollution so this effort failed over time. How are the salmon stocks in the Rhine at the moment … if you know, let me know! Thank you. circa 1890, The American ‘steel head’ or rainbow trout was imported into Denmark kicking off their start into fish farming though I think the ‘steel head’ was first brought into Europe around 1860. I visited the Bayerische Landesanstalt fur Fischerie in Starnberg, Bavaria, and Dr. Bayrle told me their records show they had stocks of both Rainbow and Brook Trout from America in 1881. Denmark went into Marine fish farming in 1974 and is doing rather well for a late starter! 1905. America’s third commercial marine hatchery starts operating at Boothbay Harbour. 1912. Prof. Hoffer, famed for his “Hoffer Pond” , designed the Wielenbach fish farm. I visited there in 1983 when Dr. Martin Bohl was planning to start a pilot plant breeding daphnia and rotifer. Does anyone reading this know how the plans progressed as in two years time, I’ll be re-looking at live feed production techniques again for a new shellfish farm development. If you have any news, I’d be very happy if you would update me, thank you. Since 1951 the Massachusetts’ State Lobster Hatchery and Research Station at Vineyard Haven has been rearing lobsters to the liberating stage for release along their coastline. 1968 . A special mention for the Late C.F.Hickling who wrote “The Farming of Fish” (Pergamon Press) because in 1986, his son, Canon C.H.A. Hickling, became a patron of the UK Educational Charity, World of Water. Hickling family Update: C.F.Hickling’s great-nephew studied for a degree in Marine Biology. Get in touch with your news. The growth in Aquaculture, following a surge in interest for this sort of farming in the 1960’s, has continued to this day – examples too numerous to mention. It was estimated in 1990 that the World Aquaculture harvest was then worth over $22 billion. In 1982, the U.K.’s Educational Charity, World of Water, worked with Dr. Seddon’s Team at the Birmingham City Museum, Art Gallery and Nature Centre to present the first exhibition on the ‘History of Fish Farming and Aquaculture’. Like Frank Buckland’s ‘Museum of Economic Fish Culture’ over 100 years before, it called for the careful, ecologically balanced development of Fish Farming. 1983 – 84 World of Water’s message toured the UK with the West Midlands Museum Service thanks to the foresight of Jocelyn Orchard. 2005 UK’s first Barramundi Farm opens. The start of the 21st century saw aquaculture take on great importance worldwide. According to a report on fishing and aquaculture by the Food and Agriculture Organization of the United Nations (FAO) in 2016, “In terms of global production volume, that of farmed fish and aquatic plants combined, surpassed that of capture fisheries in 2013”. Above summary first published as part of the ‘Wet Harvest’ exhibition, Birmingham Nature Centre, Birmingham. UK. Illustration depicting a long Shell Necklace on a bearded merman or possibly depicting early Mussel (Rope) Culture. Pen and ink drawing c.1673 Oyster Culture methods in Japan, showing the placing of bamboo hurdles in intertidal zones to catch the oyster spat fall and the harvesting. Drawing of Fish Cage (Weighted down) Date unknown but pre-dates 1856 (date of publication) A hundred years later, Dr. Marcel Huet photographs a similar system still in use in Indonesia to confine Carp. 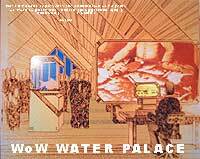 Model depicting Dom Pichon (from the 1982 World of Water Exhibition, Aber Gwen Visitor Centre). Reference Note: Fellow researcher, Richard St.George mentions that Juliana was the Prioress of a Nunnery at the time of Dom Pichon whose treatise on Pond Culture may have been reproduced in 1590 A.D.
Notes on possible First Carp in England from Dame Juliana Berners book “A treatise of Fysshynge with an Angle” (First pub., thought to be 1496. Republished Circa 1506). Date disputed – could have been 1514 A.D. (per Leonard Mascal. See below). This question was aired on a BBC TV programme filmed at Crasswall Priory. One thing that both Izaak Walton and C.F. Hickling quote, is this little ditty in their books : “Turkies, carps, hops, pickles and beer came all into England in one year”. Reference Note: 1547 may be date of 1st Edn.. 1559(Zurich? ), 2nd Edn.. 1599 Edn was first English Language Edn. and titled “Booke of Good Husbandry”. Oyster Culture Mats. Placed in sea to collect spat (young free-swimming stage in Oyster life) and provide a home surface on which the oyster attaches and grows. Diagram: ‘Caisse de Stephen Jacobi’ – rather like Kashmir or Pahari Boxes but with one or more hinged lids. Book: “A Plain and Easy Introduction to the Knowledge and Practice of Gardening, with Hints on Fish & Fish Ponds. Charles Marshall. London 1796 A.D. (Also an Edn. in 1805). Memoirs of the Central Society of Agriculture . Vol. XLVIII. 1840 Transactions of the Royal Society of Edinburgh. Preserved Trout Eggs on framed glass tube racking (On loan from Bibury Trout Farm) suspended in slate hatching troughs. Engraving: Water-powered Trout Feeding Machine “Futtermaschine fur die Kunstliche Fischzucht. Otto Hamerle”. Sieve for catching fish ova that allows ovarian fluid to drain through. Index Cards (Searle / Buckland) Museum of Economic Fish Culture, London, UK. c.1864. Photograph: Two fish egg pickers at work removing dead eggs in a trout hatchery using special cup ended fish egg picking tweezers. Message from Jane Bryant re: Ravert-Wattel, C. La Pisciculture Industrielle. 1914. G.Doin et Cie. Paris. 408p 74 fig. . Drawings: Futami Shell Culture Station (Hyogo Prefecture, Japan 1921-1938) showing experiments on collecting Oyster Larvae on Tree Branches; Bamboo Sticks; Stones; Shells; Wood Chips covered in coal tar; Concrete Blocks; Glass and Roofing Tiles. Book: Lehrbuch der Terchwirtschaft. (Pub. 1933, Paul Parey, Berlin, 289p., 71 fig.) by ‘W. Schaeperclaus’, re: Fish Farming in Germany. E.W.Searle’s original cast from the Frank Buckland’s Museum of Economic Fish Culture [c.1864] of 13 trout killed by a pollution incident. On loan from Bibury Fish Farm and Exhibited at the WoW 1982 Exhibition. We are interested in talking with TV, Radio, Film and WEBTV Production Companies wishing to develop programmes on all aspects of Global Water and Waterlife conservation. Some of the contents of this page may be the copyright © of contributors and therefore rights reserved. Bardach, J.E., 1972 J.H. Ryther and W.O. McLarney, Aquaculture; the farming and husbandry of freshwater and marine organisms. Wiley-Interscience, N.Y. 1972: XIII + 868 p.
FAO. 1976 Symposium on aquaculture in Africa, Accra, Ghana, 30 September–2 October 1975. CIFA Tech. Pap., (4) Suppl. 1:791 p.
FAO. 1977 Simposia sobre acuicultura en America Latina, Montivedio, Uruguay, 26 de Noviembre a 2 de Diciembre de 1974, FAO. Inf. Pesca, (159) Vol. 3: 136 p.
Hickling, C.F. 1962 Fish culture. Faber and Faber, London: 296 p.
Hickling, C.F. 1968 The farming of fish. Pergamon Press, London: 88 p.
Hora, S.L. and T.V.R. Pillay. 1962 Handbook on fish culture in the Indo-Pacific Region. Fisheries Division, FAO, FB/T14: 204 p.
Ling, S.W. 1977 Aquaculture in Southeast Asia: A historical overview. A Washington Sea Grant Publication, Contributions, College of Fisheries, University of Washington No. 465: 108 p.
Pacific Islands Development Program, East West Center, 1984 A review of aquaculture activities in the Pacific Islands Region, PIDP, East-West Center, Honolulu, Hawaii, May 1984: 1–22 papers with variable pages. Pearl River Fisheries Research Institute. 1980 Pond fish culture in China. Pearl River Fisheries Research Institute, China National Bureau of Aquatic Products, February 1980: 136 p.
U.S. Commission of Fish and Fisheries, 1900 G. M, Bowers, Commissioner. A manual of fish-culture, based on the methods of the United States Commission of Fish and Fisheries, with chapters on the cultivation of oysters and frogs. Washington Government Printing Office, Revised Edition, 1900: X +340 p.
Fellow researcher on the subject of Fish Farming History, Jane Bryant, mentions that in 1968, Theatrum Orbis Terranum Ltd.(Amsterdam) and De Capo Press, New York, published a facsimile of Taverner’s book.